In Episode 27 of the Close Knit Podcast, I spoke to Anna Barberio of For Flynn Protest Art. badass cross stitch - ep 26 of the close knit podcast! hot cross puns - R. Jones - very badass crosstitchery. In Episode 23 of the Close Knit Podcast, I spoke to Emma Lehan of The Fleece and Wheel.Emma is a knitter and spinner based in Queensland. We chat about how Emma’s interest in knitting eventually led her to spinning, and how her thoughtful partner gave her a drop spindle as a christmas present a few years ago, leading her down the path she’s on now. Last year, Emma got involved in an Etsy Local market, which was a huge motivator for her to get her business up and running. We talk about how she’s managed her business and why she’s chosen to source locally. Emma walks me through how she has found her sources of fibre and how she’s developed these relationships over time. Emma's Handspun Alpaca for the giveaway! GIVEAWAY CLOSES FRIDAY, 27TH JAN 2017 8am AEST. "Have a go. Because a lot of people think 'I can't possibly do that'. and that's wrong, of course you can, you just have to try... Just start, and don't get discouraged"
the unusual pear - where Emma got her first drop spindle! A huge thanks to this week's episode sponsor - Gradient Yarn Australia. Gradient Yarn Australia is an independent yarn dyeing business started by Briony Mannering. Briony is an Independent yarn colourist, teacher and knitwear designer based in South East Melbourne. 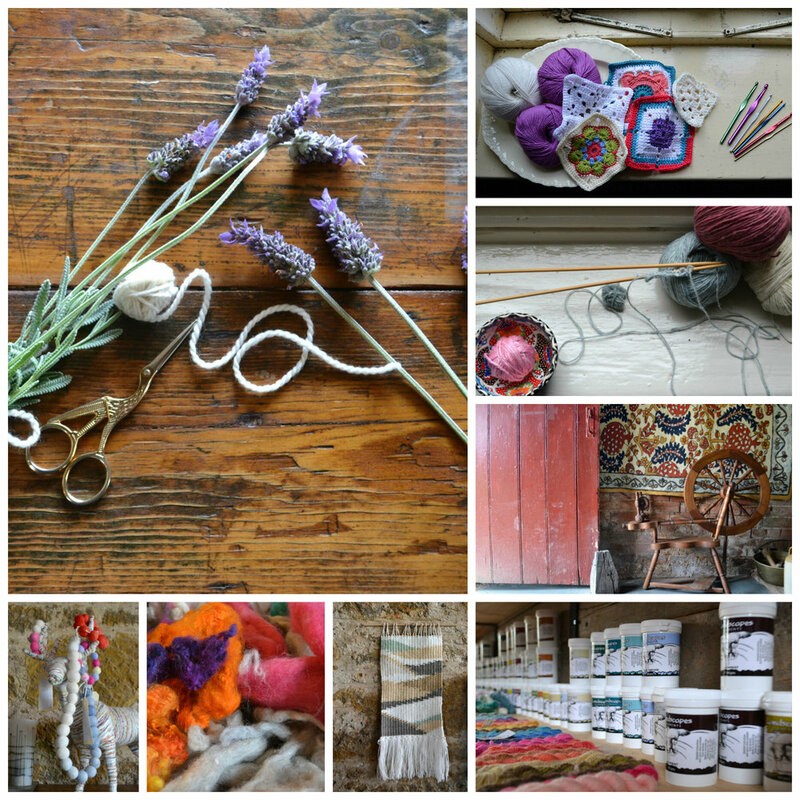 Her passion for craft lead her to yarn dyeing in 2012. A few years later started working on her knitwear design. Now, she’s known for her yarn line of smooth graduated colours, and her knitwear designs that artfully display these colour schemes. A typical day will find Briony dyeing and experimenting with dye techniques in the mornings, and knitting in the afternoons. Her latest yarn evolution is utilising local yarn and combining with natural dyes. When she was younger, Briony nearly ran away with the local circus! The only clowning around she has time for now is with her two young boys. This week I spoke to Lisa Anderson Shaffer of Zelma Rose. Lisa is a fine artist and sculptural jewellery maker living in the Bay area in California. We talk about her grandmothers (Zelma and Rose, respectively), who introduced her to needlework and crochet as a child, and how she's used these crafts to inform her art practice today. Lisa tells me about her fibre of choice in her jewellery making practice and how when she works with these fibres, it's like a dance to her, it just feels right in her body. When we get into how Zelma Rose came to be and how she approaches it present day, Lisa opens up about her experience transitioning from her career to making art and jewellery full time, and how her experience as a mother has shaped how she has shaped her business. We discuss how fibre arts is such an ancient practice, but how presently its popularity is growing, but at the same time how it's under the radar enough that Lisa doesn’t feel the pressure to have the traditional production calendar like some of her friends in metalsmithing or leatherwork or the fashion world. Lisa tells me about how she started zelma rose in 2010 and what she referred to as her "life in chaotic crisis pregnancy business plan", which she remarks that she wouldn't necessarily recommend. She was fed up with her day job and had to leave, and so Zelma Rose was born. She found that she had tons of creative energy whilst pregnant and a desire to make product, before that she had always made fine art. As her business grows, she has to pull the break a bit to be able to be the mother she wants to be. it’s been a steady climb for the last 6 years - a steady slow burn. Carrie Crawford - @mineral workshop - Lisa loves her work so much, has a “wish I thought of that” moment wth her a lot. canvasses on cotton that are handdyed, interpretations of aerial landscapes. Lisa also loves following skateboarders, just something about them makes her so stoked. A very special thank you to this week's episode sponsor, Wool Gathering, a four day wool crafts based retreat being held in Victoria in May 2017. During the Gathering you will participate in three wool based classes, with options in knitting, crochet, spinning, tapestry weaving, Saori weaving, needle felting, wool embroidery and yarn dyeing. Wool Gathering teachers have many, many years of experience between them, and include Sue Grandfield (Riotous Assembly); Clare Devine (Knit Share Love), Briony Singleton (Gradient Yarns Australia & Briony Knits), Prue Simmons (Dyeing to Weave) to name just a few. Classes have been designed to suit all levels of experience so you have the option to take all your classes within the same well loved craft or you can try something completely new as beginners are well respected at Wool Gathering! Participants of Wool Gathering will get to enjoy the incredible Tarndie Farm. Tom Dennis, the current (6th generation) owner, will entertain you with his History of Tarndie tour where you will learn all about the pioneers who settled the property and then the Fleece to Yarn tour will see you walk with the sheep from the paddocks to the shearing shed where you will learn all about Polwarth fleece. Tickets are currently on sale and you can find all the nitty gritty details at www.woolgathering.com.au and follow along on instagram - woolgatheringaustralia and facebook - wool gatheringaustralia. Julie is a free form fibre artist, utilizing weaving and macrame techniques to create her unique wall hangings. She and I discuss a mutual love affair with all things linen, and how she made a transition from using whatever materials she found to thinking more consciously about where her materials came from and how they were made. We talk about navigating the complex space of pricing and selling handmade work, and how she keeps up the motivation to continue making work regularly. Julie tells me about her love of teaching free form workshops as a form of art therapy for herself and her students, and how she has used this style of making to lighten her own state of being when going through some tough times. Julie teaches workshops in free form - intuitively creating using beauitful materials and a few simple knotting and weaving techniques. She recounts how people often struggle with this at first and find it confronting, the fact that they're not being told what to make, but once they drop in, and let go, it's such a special feeling. Julie tells me she gets goosebumps just talking about it. Julie first picked up weaving when she was struggling with post natal depression. It was a meditative escape for her, and somewhere she found some peace. At first, she reckons she tried too hard, tried to be what she thought a weaver should be, and that just wasn't working for her. Then she bought some handspun yarn and decided to not try so hard and to let go. It was at that point that she created the first piece she really loved, and that was a really pivotal moment for her. She started listening to Woolful, and started learning about fibres and then moved exclusively to high quality, ethically-source, and rare and vintage fibres. "...don' be afraid to try. There is no right way, there is no wrong way, just try. If you have an idea for something, don't not do it because you think it won't be well received, or because you think it's not the right way to do something, just try. That's how we learn, evolve, grow. And the fibre community is so encouraging and supportive"
In episode 16, I spoke to Sarah Belcher of Blue Highway Handdyes. Sarah lives in Texas, where she creates naturally dyed yarns from locally raised animals. We talk about her journey into dyeing, and how she couldn’t imagine acid dyes in her home around her family so she looked for an alternative and found natural dyes. She then went on to create her own yarn bases for her natural dyes fromTexas -raised merino and mohair. Sarah is a a self-described "yarn sniffer" - which of course we bonded over instantly. She wanted to make her own wool and realised that there was a ton of merino and mohair in Texas and most of it was being sent abroad in bales. That led her to create her Tex Ranch yarn base - from Texas, and spun in Penn. When I asked her about how she went from the idea to make a local yarn to actually doing the thing, she told me that she first just googled american mills, she knew about green mountain spinnery from when she lived in vermont, and mountain meadow mills, and coincidentally there is someone very close by making a small mill. Those guys would take a smaller minimum of fibre so that meant she could get small amounts processed more easily. She was able to figure it out by asking and the fibre community has been so open to sharing knowledge. We also discussed many of the larger mills are often not aware that there is a huge market for farm to needle and lament the mass textile market that all of the wool goes overseas automatically. Sarah is a process knitter - she just knits to knit for the sake of it. it quiets her mind, and she knits a little bit every night to wind down. It's like meditation. "comparison is the thief of joy. look long enough to get inspired, but not so long to feel less about your own efforts." fibershed - resource for making clothes locally - highly recommend checking them out!